In the summer of 2014, some theater enthusiasts signed a lease for a salon de fiestas, or party hall, on Avenida Independencia, installed upholstered chairs, theatrical lighting, and a stage, and created the San Miguel Playhouse. The theater opened its doors for its first production, Moonlight and Magnolias, in October 2014. Four years later, the playhouse had hosted more than twenty full theatrical productions, and an even greater number of concerts, readings, and benefits. In 2017, a supertitle system was installed, and a Spanish-language production of Long Day’s Journey Into Night, with English supertitles, ushered in a new era of community-uniting bilingual theater. Highlights of the four years of the playhouse include the immensely popular Diez Minutos festival of ten-minute plays; comedies such as the rollicking farce The 39 Steps; musicals like Little Shop of Horrors; bracing dramas such as Red, and the acclaimed Latin American premiere of The Madres, a new play about the military dictatorship in Argentina. 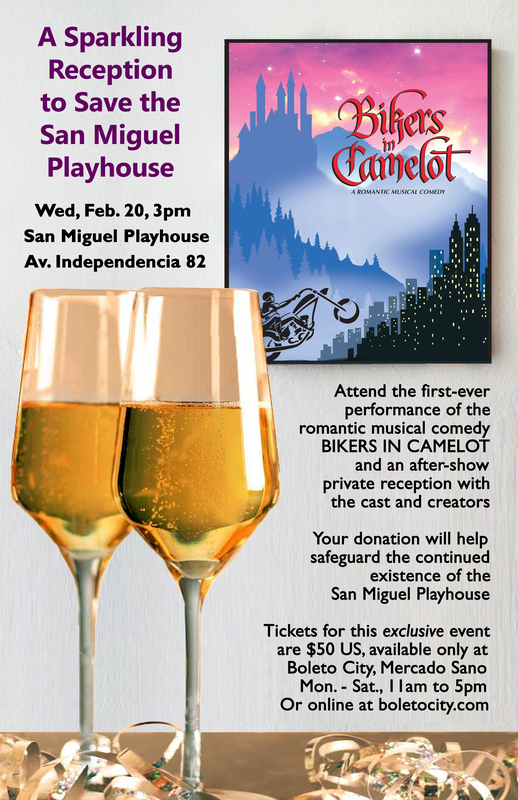 Incontrovertibly, in four years, the San Miguel Playhouse has become the city’s most significant cultural institution for high-quality theater. Now, however, the institution is in peril. The lease has expired on the playhouse building, and the institution known as the San Miguel Playhouse must deal with the real possibility of eviction. A group of business professionals with a love of theater is launching a capital campaign to preserve this important cultural institution. For those who do not wish to purchase online, tickets may be purchased Mondays through Saturdays, between 11am and 5pm, at Boleto City, the ticket desk on the second floor of the Mercado Sano, Ancha de San Antonio 123, for either $50 US or 1000 pesos. The phone number of Boleto City is 152 6432.